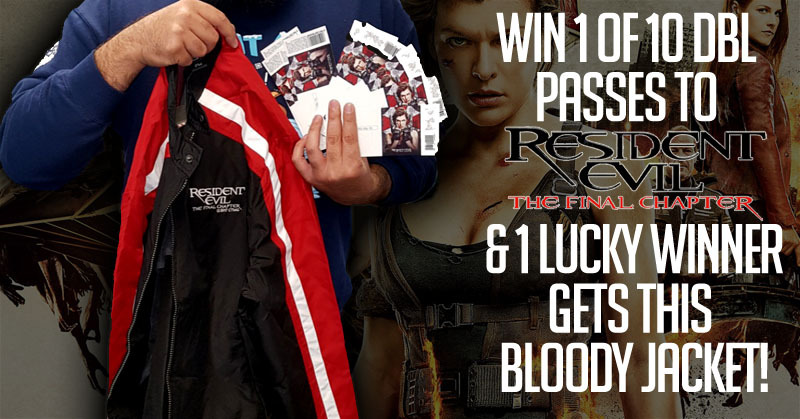 Thanks to Sony Pictures, we’ve got 10 in-season double passes AND 1 bloody jacket to giveaway to Resident Evil: The Final Chapter! Picking up three weeks after the events in Resident Evil: Retribution, humanity is on its last legs after Alice is betrayed by Wesker in Washington D.C.
As the only survivor of what was meant to be humanity’s final stand against the undead hordes, Alice must return to where the nightmare began – Raccoon City, where the Umbrella Corporation is gathering its forces for a final strike against the only remaining survivors of the apocalypse. Okay, so the jacket isn’t bloody, but it IS very cool. A size large, and made for riding through the zombie apocalypse, 1 lucky winner will receive this wicked jacket and an in-season double pass to the film! 9 other winners will get their own in-season double passes to see the film when it releases on 26th of January! All you have to do is fill out the form below and done! So END EVIL, and ENTER! Win With Resident Evil: The Final Chapter! EVIL WILL END in Resident Evil: The Final Chapter! Simply enter your details below to enter! I KNOW YOU WANT THAT GOOD JACKET! - Competition closes Wednesday 25th January 2017 at 12PM NZT. - Winners will be chosen on Wednesday 25th January 2017 at 12PM NZT. - The winners will reply to That Guy Xenojay by Monday 30th January 2017 at 12PM NZT - otherwise we will re-draw their prize.